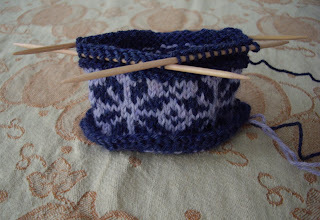 I have made a good start on Elizabeth Zimmermann's Norwegian Mittens, and I certainly learned a good deal about the genius of EZ. Please ignore the dreadful color combo (delft and delphinium)! 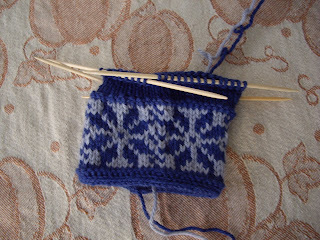 This was the only Telemark around, and I couldn't wait for my new order to arrive to swatch. So, EZ recommends using an i-cord cast-on for this (knitting 56 rows of i-cord, joining the ends, then picking up 56 stitches). Yeah, I thought that sounded like a pain in the a%&, so I used the long-tail cast-on, knit a couple ridges of garter stitch and began the colorwork. Bad plan! Look at the awful curling. After my new yarn arrived (alpine frost and snow leopard -- nice wintry names! ), I tried out her fancy cast-on. Guess what? It rocks! No curling, there's a really neat, corded edge, and I'm thrilled with it. EZ was right, but I was right, too -- it was a pain in the a$% to do. It's worth it, though. Hmm... the color combos don't look too different on the computer, but they look quite different in real life. In other news, a marvelous parcel from Allison arrived on my doorstep for the Knitter's Tea Swap (details on that blog). Thanks, Allison! I'm spending the evening at home in front of a roaring fire, knitting, and possibly watching season 1 of Angel. Oh yes, grading papers, too. 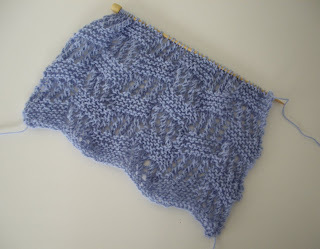 This is a very easy pattern to follow, and it's nice not to cast on or bind off a ton of stitches. 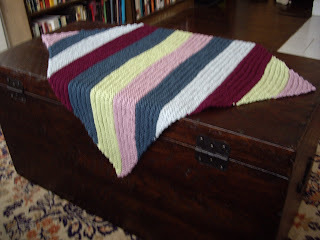 I made the stripes wider than the pattern, and I substituted aran weight yarn for chunky. I wanted the blanket to be soft, floppy, and cuddly, so I went up to size 9 needles. In retrospect, size 8 would have been better. The final segment comes to a strange point. I may end up adding the corner tassels as per the pattern just to disguise the goofy corner. Modifications: Added 2 medium carrots, diced, along with the lentils. Substituted chicken stock for water. Modifications: Substituted light cream cheese for fat-free. Added Tabasco sauce to the filling mixture. The soy crumbles have a little soy aftertaste, but they're so darn easy to use that I would do it again in a heartbeat. Alternately, browning lean ground beef with the onion would work fine. Modifications: Made extra orzo. Used only red peppers, no green. This recipe is a long-time favorite! Highly recommended. For many, socks are the comfort food of knitting. Not me! I like mittens. They knit up so quickly, the shaping makes them interesting, and they're not too fussy in terms of fit. Since there's not too much yarn involved, it's a great way to experiment with new yarns, ones that would be too expensive for a larger project, or that ball or two you found in the clearance bin at the LYS. This is my first time knitting with Rowan Kid Classic, and I'm enjoying it immensely. The mohair gives it a nice fuzziness, and the lambswool reminds me of the sweaters I wore as a little kid during those freezing Minnesota winters. I want to knit a little Tomten jacket in this exact shade of cherry red. BTW, does anyone know a good pattern for cabled mittens in worsted or aran weight? I haven't had much luck, even on Ravelry. 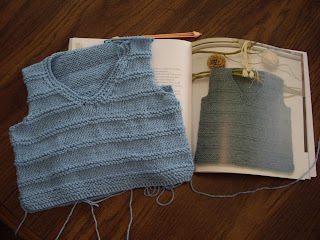 The Winter 2007 Interweave Knits preview site is up. There's not much of interest to me this time. All the photos and styling look rather dated or amateurish. The Sweater Girl Pullover, Refined Aran Jacket, and Gathered Pullover are OK. If you're a fan of young adult fantasy novels, Jane Austen, and Georgette Heyer, this is the book for you. It's a charming read, set in Regency England. Like the more sophisticated Jonathan Strage and Mr. Norrell, magic is alive and well in England of the past. The book is set up as epistolary fiction; two young ladies feverishly write letters back and forth to one another from London to the countrywide. Magic, romance, and mystery are afoot. It's hard for me to belive this is a first novel. It's witty, intelligent, and engaging. Blue van Meer, the daughter of an eccentric academic, takes up with an unusual circle of friends led by an enigmatic teacher. Categorizing this novel is difficult -- it's very learned while still being very funny and real. It's part bildungsroman, part mystery, part homage to great literature. Pessl sets up the novel as a class syllabus; each chapter takes its title from a classic book. It's a bit similar to Donna Tart's Secret History, but much, much better. These mysteries make for great travel reading. An aging Sherlock Holmes, retired to the countryside with his beehives, takes the young, headstrong, and very smart Mary Russell under his wing. While these books are light reading that are largely plot-driven, they're a huge step up from most mystery novels. King incorporates historical and literary figures in the books (e.g., the Reverand Sabine Baring-Gould and Rudyard Kipling's Kim), and the fictional accounts of travel and detection in the 1920s are engaging. Naturally, Mary Russell is a plucky heroine with a strong, independent spirit (and a real talent for languages, which I always appreciate). Michaele (AKA the Knitty Professor) collects "puking" animal creamers -- china creamers in the shape of animals where the mouth is the spout. She had a contest for a name for her newest acquisition a while back. I contributed the playful name "Vominatrix" and was the lucky winner. 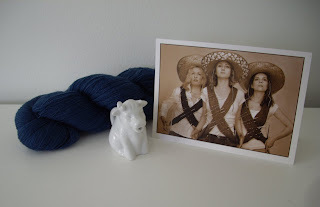 She sent me my very own puking cow creamer, an awesome card, and some beautiful dark blue laceweight wool yarn from Sweden that I just love. Thanks, Michaele! I did some test knitting for Sarah at The Plucky Knitter, and she sent me some gorgeous handpainted 50/50 bfl suri alpaca blend sock yarn. The colorway is "Barefoot in the Park"' I'm planning to knit some simple ribbed socks with it so that I don't have to go "Barefoot in the Cold Apartment" this winter. Thanks, Sarah! Dropping all those stitches was terrifying, but it worked out quite well in the end! I had to start it at knitting night for the moral support. Many thanks to Ms. Prolix, who dropped the first stitch for me! BTW, her Venezia is coming along beautifully. I wish I had that much knitting skill and patience! It still needs to be washed and blocked. So far I'm quite pleased. Ideally it would be a bit longer (at least another 100 yds' worth of yarn), but I'm glad to have knit from the stash. This pattern would be lovely as a narrower scarf, too. Malabrigo + size 6 needles = bulletproof fabric on my Mr. Greenjeans (but I got gauge!). 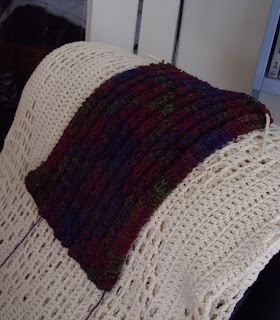 I'm thinking of frogging, starting over on larger needles, and knitting the next size smaller. I don't want to do anything rash, though! Elann's Baby Cashmere is one of my favorite yarns -- soft, lovely, and downright affordable. I would like to have pajamas knit out of it! I used the pink for my Falling Water Scarf way back when. Some coordinating Delicato Mitts would be lovely, no? Everybody Likes Sandwiches is a recent blog discovery. 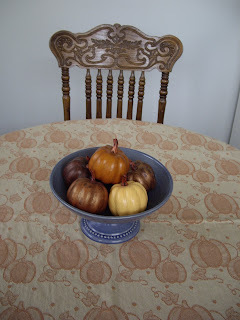 Great blog, lovely photos, delicious recipes, down-to-earth, what's not to like? I made the Chai-Spiced Apple Oatmeal Bread a couple nights ago. It's easy as can be. Spicy and yummy, not too sweet. Not great for packing in lunches, though, since it's very tender and easily falls apart. Have fun at Rhinebeck, all you lucky ducks! Many thanks to all who entered! I managed to screw up while drawing lots, so I'll have to find something to send Pam, too. Have you seen her new socks? Gorgeous! Wow! There's a lot of dedicated sock knitters out there! Thanks to all for entering my little contest. I'll keep taking entries for the rest of today, and I'll draw a couple names tomorrow. Unless you're one of my swap partners, this entry is probably not too interesting. Either! Flavored usually wins out, but really good regular is awesome, too. I make a pot of drip coffee just about every morning, and drink my coffee with fat-free half & half (thank you, modern science) and sugar as I check my email. I sometimes break out the espresso maker or the French press. For a special treat, I add a nip o’ Bailey’s to my coffee. Medium-fussy. Not a big fan of my mom’s Folgers or my in-laws’ Maxwell House. Biscotti, scones, coffee cake, cookies. I grew up in a Minnesotan-Scandinavian-Lutheran household like in Lake Wobegon. Sweet tooth, lots of coffee. I’m trying not to eat too many sweets, though, so please don't go on overboard on treats. I love trying new coffees from indie roasters, esp. flavored coffees. Soft, natural-fiber yarns are the best! I’m a big fan of Malabrigo, Rowan 4-ply soft, Mission Falls 1824 Wool, and Debbie Bliss Cashmerino Aran (yes, it’s a blend, but it’s amazing for baby knits). Not a fan of 100% acrylic, boucle, or anything too wild. 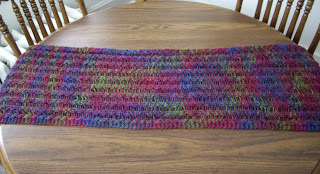 - “Hattie’s Rose Garden” shawl in Mountain Colors alpaca blend, in deep shades of raspberry, blue, brown, and green. 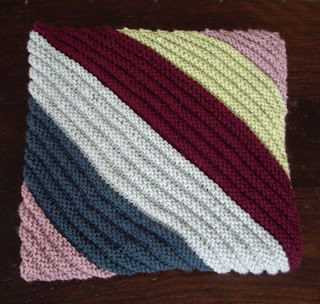 - diagonal striped baby blanket in DB Cashmerino Aran - lots of colors! Blue (light or dark), plum, dark red, lavender, chocolate brown, green, natural, wine... Not a fan of really bright or pastel colors. I’m looking forward to trying some new coffee and getting to know some knitters! I really like mugs – ones with UK or sheep themes, Polish blue floral pottery mugs, even plastic travel mugs. How long have you been knitting & how did you learn? Almost 2 years. I learned at a coffee shop here in Chicago. Intermediate. I’m fairly new to colorwork, and so far I love it! I’m into cables and easy lace. What are your favorite colors? Any you dislike? Blue is my absolute favorite color, pretty much all shades from periwinkle to navy. I also like dark red, plum, green, lavender, aqua, chocolate brown, and cream/natural. I’m not a fan of really loud or bright colors or pastels. Do you like Latvian type patterns? If so, what are your favorite patterns? I love how they look, but I haven’t tackled any actual Lativan patterns yet! 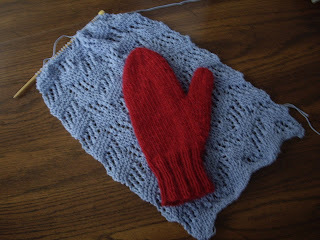 I’m pretty excited about Scandinavian-style mittens, as well as whimsical variations. My favorite pattern is “Squirrel and Oak” mittens from Hello Yarn. I’m working on a pair in chocolate brown and tan. Do you desire mittens for yourself, your "special someone else" or your child? Me! My husband wouldn’t wear mittens, and we don’t have any kids yet (just cats). What other things do you enjoy knitting? Straights or circs. I haven’t tried magic loop yet. I stick to bamboo or wood most of the time, but I do like Pony pearls for socks and the Knitpicks metal circs. I would like to try Swallow flexible casein needles at some point. What’s one project you’ve not yet tried but are dying to make? What’s one yarn you’ve not yet tried but are dying to work with? What other hobbies do you have? Do you spin? Sew? Garden? Cook? I’m very into cooking and baking (love Cooking Light magazine). I’m a big reader (mainly fiction), I’m into music (indie rock but also things like Simon & Garfunkel), and I like to quilt, embroider, and cross-stitch. 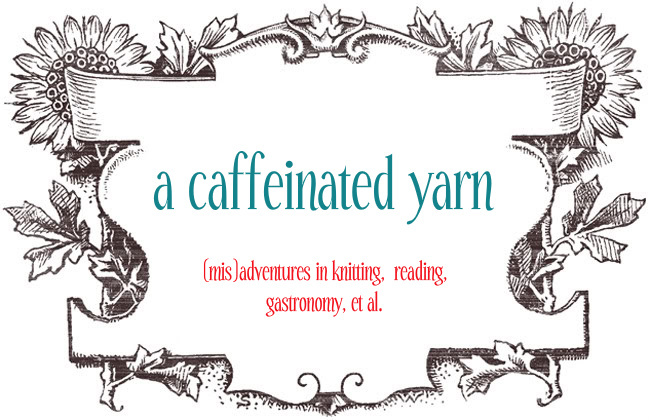 Besides yarn, do you collect anything? I like mugs – esp the blue floral Polish pottery mugs, mugs with UK themes, and mugs with sheep/knitting themes. Books, too! What kind of goodies do you enjoy? Sweets? Salty? Anything you hate or are allergic to? I like sweets – chocolate (milk or dark), mint chocolate, scones, biscotti, and dried fruit. I’m trying to lose a few pounds, so not too many goodies, please! I love trying new teas and coffees. I’m not into gummy or hard candies. No kids yet. We have two beloved brown tabby cats, Capricha and Kylie. Almost everything! Snowflakes, cold air, snuggling under a down comforter, ice skating, sledding, cross country skiing, ice-covered trees, wearing handknit woolen socks and mittens, drinking hot cocoa in front of my wood-burning stove… I grew up in Minnesota, and winter is my favorite season. What is your least favorite part of Winter? Driving in Chicago and trying to parallel park between snowpiles. 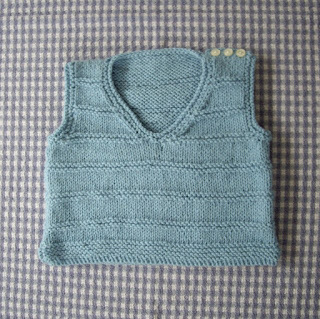 Lois Daykin's Baby Knits arrived on my doorstep the other week. It features a wide array of projects, from a sweet, lace-edged wrap cardi to intarsia baby blankets, to textured rompers. Daykin most definitely likes pockets, adding them to the rear ends of baby dresses and the chest of a cute little baby vest. You know what though? I'm not really into intarsia, rompers, or pockets. Baby knits designed by Elizabeth Zimmermann, Debbie Bliss, and Louisa Harding are more my style, and my baby knitting queue is pretty full right now. 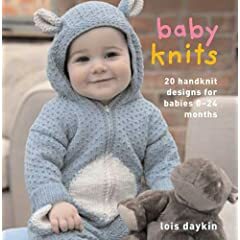 It's a good, solid baby knits book, but just not the one for me. Leave me a comment if you're interested in my copy of the book, and I'll send it to you along with some wool-blend, machine-washable baby yarn! Not into baby knitting, but like contests? 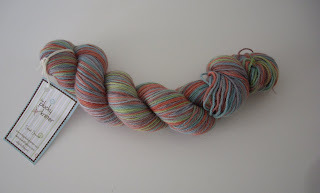 How about some bright-colored hand-dyed sock yarn? Leave me a comment saying that you're a sock knitter. Deadline for contest entries: Saturday, Oct. 13. Notes: This is not a difficult pattern, but the instructions for shaping the V-neck and armholes are woefully inadequate. I'm sure Harding was trying to make it easy for knitters with different row gauges, but I ended up writing out row by row instructions. The yarn was quite nice to knit; I like it better than RYC's Cashsoft line. It's soft and slightly elastic, and the cashmere gives it a soft glow. I easily could have made the largest size (up to 12 months) with two skeins. 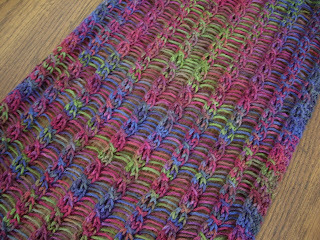 I'm running out of yarn on the diagonal baby blanket, so it's on hold until I make a yarn store trip. I cast on for Hattie's Rose Garden, a dropped stitch shawl pattern from Briar Rose Fibers, using Mountain Colors Alpaca Blend in "wild raspberry" from my stash. It's a lovely and easy pattern. I had intended to use my Briar Rose Wistful from the WI Sheep & Wool Festival, but it's being saved for the Morning Glory wrap from Knitspot instead. Not the best picture, I must admit. Real Simple's Pumpkin-Leek Soup recipe was a real hit around here. It has a great texture since you use both canned and fresh pumpkin, and it's wonderfully healthy. Here's the delicious pesto recipe, as promised. The spinach really makes it outstanding! Combine all ingredients EXCEPT olive oil in a food processor or blender. Cover and process using the pulse feature until a paste forms, scraping the sides occasionally. With the machine running slowly, gradually add olive oil and process until you reach the desired consistency. It whips up a bit. Great with pasta, chicken breasts, even just thrown in with rice to give it some flavor.